17 How precious to me are your thoughts, God! How vast is their sum! Have you ever tried to count the number of grains of sand there are on a seashore? While it might be technically possible to do, I think it is very close to the realm of impossible. There is simply too much sand to be able to even begin to count. 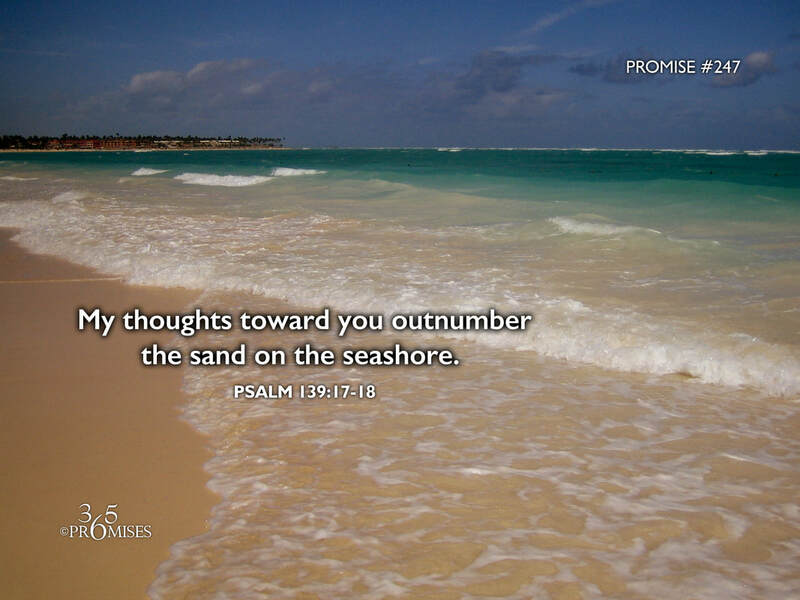 King David makes a declaration that the thoughts of God toward him literally outnumber the grains of sand on the seashore. Basically I think what David was saying was that God is continually thinking of him! Non stop... all the time! If we try to comprehend this promise with our human understanding, we will short circuit for sure because it does not seem possible that God would be constantly thinking of us. I am so thankful that our Heavenly Father is not limited by our own human limitations! The truth is that He can do whatever He wants, however He wants to do it. My prayer for each one of us today is that we would become more aware of the longing in our Papa's heart for us. He is thinking about you RIGHT NOW! And right now, and right now again! Isn't that amazing? The God of the universe cannot stop thinking about you and me! May this life-changing truth sink deep down into the depths of our heart and transform us more and more on the inside.